Welcome to the winter issue of 'Hyakunin Issho'. I think you will be reading this in early January, and I'd like to let you know about a sort of 'anniversary' I've just had. I arrived in Japan on July 1st 1986, so this year-end just past marked eleven and a half years that I have been living here. 11.5 x 4 = 46, and yes, I've also just passed my 46th birthday, so it seems that exactly one quarter of my life has now been spent in Japan. But here I am, eleven years in the same building in the same community, and I have to say that although I don't really like the 'concrete box' in which I live, I just don't feel the impulse to 'move on' and look for something else. I can think of only two possible explanations for this: either it's because I'm getting old and losing energy ... or perhaps it's because I'm happy and content! Which one do you think it might be? This audition that was coming up was a very important chance for me; if I was the successful candidate, then my future would be assured. So did I make special attempts to practice and prepare for the audition? No, I just continued working during the day and relaxing in the evenings 'as usual'. I 'knew' that I was a good player ... 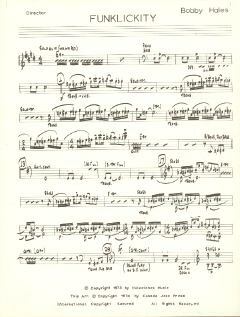 I 'knew' how to play the standard orchestral repertoire ... I 'knew' many of the orchestra members; they were my friends from the summer camps ... I just 'knew' that I would get the job. Well of course you know what happened. I flubbed it completely. I was in poor condition from not practicing; the pieces I was given to play were some that I had never seen before; I made a beginner's mistake and failed to notice the conductor's tempo indication; all in all those orchestra member friends were probably embarrassed to be associated with me ... As it happens a young boy from Japan came in and played so fabulously well that all the rest of us were blown out of the room. He had prepared well. He had practiced. He had spent years in preparation for this chance. He got the job. I suppose I must have made some kind of excuses to myself; I don't remember being particularly devastated by the failure. But looking back on those times now it is quite clear that this episode was pretty much the beginning of the end of my flute playing career. I sometimes wonder what would have happened if we had lived in a society with different rules - one where couples got married first, and then discovered what their partner was really like only later. Would we have adapted to live together well, or would we have become an unhappy couple? I'll never know, but I do know that I am thankful that our parents were understanding enough to let us have the experience, and also that society permitted it. I was quite dejected when she left, as I had been completely happy when with her, but I came to realize that the experiences of those years had been very valuable ones; if I hadn't met her when I had, I would have remained a quiet and immature little boy. She had been very important to me. I've been writing these 'Visit to a Craftsman' stories for many years now, and sometimes when I have been preparing for the visit, I have thought "Actually, I don't even really need to go and visit this man - I know what I'll be seeing and hearing; I can just stay home to write the story ..." And perhaps you readers have had the same feeling - once you've seen the title and introduction to a story, you pretty well know what is coming up. Of course, I headed for Shitamachi, home of traditional woodblock craftsmen for hundreds of years ... Oops! Seki-san lives in the Tokyo suburb of Hachioji, in a modern house in a modern housing development. Once welcomed into his home, I stepped into the tatami-matted work shop ... Oops! No tatami! Seki-san works in a wooden-floored western-style room. There in the room was the low printer's bench ... Oops! Seki-san works standing up at a high western-style workbench! There on the work surface are the cherry blocks for a reproduction of an old Ukiyo-e print, carved by one of the old 'hori-shi' ... Oops! These blocks are plywood - the picture is a modern landscape - and the carver was ... Seki-san! There is no room for us to sit and talk in this tiny workroom, so we sit in the modern living room downstairs for our conversation. I have a million questions for him - and not just for this newsletter story. Hidden away inside my bag are my baren and some prints ... I also have some questions to ask him about my own printing work. Will I get a chance today? But the first question must obviously be about these new 'original' prints he is making; what is going on? He shows us a few of them - landscape scenes drawn without strong outlines, in a 'misty' and dreamy mood. They are quite large, and are presumably meant to become decorative accessories in a modern style home. 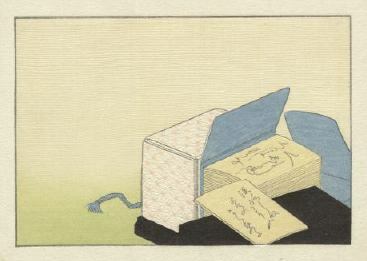 It turns out that there are a couple of reasons why Seki-san has turned to such work: if he simply sits by the telephone waiting for print publishers to call, he may be waiting for a long time; woodblock prints are a 'luxury' item, and in the current economic climate prints do not figure large in many peoples' minds. There is very little work available in the traditional field at the moment. As we talk to him about these pictures though, it becomes evident that another factor is at work here - he is very much enjoying himself in the creation of these prints. 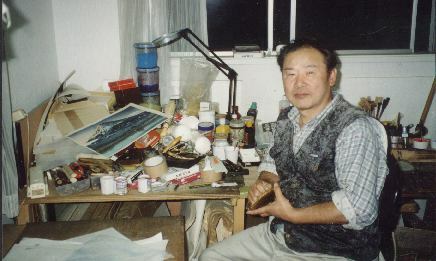 Although he was trained as a 'suri-shi' (a print craftsman) to simply print and print whatever was sent across his desk by the publishers - without having any opinions on the work at all - it seems that during all these years he has been watching and studying the prints under his baren, and has absorbed enough by doing so to now allow him to move one step further back up the chain, to design his own works. "When you started, you were only 14 years old. I guess you had to do all the 'grunge' work for everybody else, right? Grinding the pigments for hours, cutting all the paper ..."
"No, not at all. All the men always did those jobs for themselves. They were 'shokunin'." "Well, you must have been the one who had to do all the boring jobs ... rubbing all the brushes on the sharkskin ..."
"No, no. I did my brushes of course, but everybody else did their own, even the master. They were shokunin." By now in the interview, I was starting to feel a bit frustrated. Were all my ideas about Seki san's life to be completely upside-down? "Well then, tell us about the first printing jobs you had to do, you know, the simple stuff like printing wrapping paper ..."
"Oh, that's not the sort of thing I started with. My master had the idea that I could do 'easy stuff' anytime; if I learned the trade by starting with difficult jobs, I would then be able to handle any work that came along. The very first job that was given me was to make 100 copies of a difficult multi-coloured print. Of course, I made a complete mess of it. Nobody told me what to do, how to do it ..."
What happened to those 100 prints? "Once I had finished the job, the master looked at them, took a knife, and simply cut the whole stack in half. I was then given my next assignment - another very complex print. I saw all those sheets of beautiful 'washi' being thrown away and I tell you, I learned fast!" Didn't they start to give you some instructions? "No. Nobody told me anything during the entire ten years that I was there. I just had to watch and figure it all out on my own. You can't learn something just by asking questions - your hands have to learn by themselves!" "Yeah, that's right. I got 500 yen a month. And we had two days off, the 1st and 15th of every month." At last! Something that matches my preconceptions! I eagerly press ahead. "So those two days must have been real 'freedom' for you - going to the movies, taking your girlfriend out ..."
"No way. I was too busy in the workshop - taking care of my brushes, trying to learn how to make a baren ... And besides, I had to save up my money so I could buy tools. The other guys lent me some of theirs at first, but those had to be returned. I had to buy all my own stuff." "It sounds like it must sometimes have been a pretty frustrating time. Were you glad after the years of training when your master finally said you were ready to be an independent shokunin?" "Well ... He was a pretty strong-willed guy, and I guess I'm also fairly strong-willed ... It didn't end up quite so neatly as that. One day, after about ten years, there I was out on the street. I had to start from zero. But boy, could I print! I could do any job that anyone cared to throw at me. I could print anything!" "The cord is too loose - you can't use a baren like this!" I nod in agreement and shrug my shoulders helplessly. And then suddenly, in a burst of motion ... flip, twist, loop, tug, tie ... It takes but a moment for him to retie the cord and pass the baren back to me. Tight as can be. Wonderful! But it was like watching a magic show on TV; I saw nothing - just a blur of fingers! I smile ... and I smile ... and I smile! The other day, when I was at some office or another, I had to fill in a form asking for basic personal information; name, address, etc. I got past the first section without too much trouble, but when I came to the blank space labelled 'Nationality', I found myself pausing a bit. Of course, I wasn't really in doubt about what to write, and I went ahead and filled in the space to match all my other legal documentation, with the word 'Canadian'. But I have to wonder if that was the correct answer to the question. For you see, I do not really feel 'Canadian', and I am certainly not only 'Canadian'. I was born in England, to British parents, and thus have British nationality. When I was still just a small child, our family emigrated to Canada, and a few years later, my parents obtained Canadian citizenship for themselves and their children. I am not familiar with current regulations concerning these matters, but it seems that at that time anyway, this could be done without jeopardizing the original British nationality. 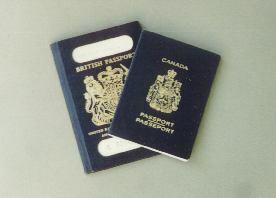 I thus found myself in the position of having two nationalities, British and Canadian, and indeed, I now have two passports. 'True patriots' love'? Well, excuse me, but I simply can't say that's the way I felt about Canada, neither then nor now. Yes, I lived there for a long time (29 years), but it was basically just a place to live ... a location, nothing deeper than that. Perhaps part of this was due to the fact that our family was very mobile, and during those 29 years I lived in at least eleven different homes. I am sure that this habit of being constantly uprooted every few years went a long way to suppressing any developing feelings of 'homeness', either for a particular town or area, or for the country as a whole. And now, after all these years of living here in Japan, any such left-over feelings for Canada as a 'home' are quite weak. So when I said 'not really' Canadian, what I meant is that I just don't feel much connection with the place any more. When people now ask me questions like "How do they do such-and-such in your country?" I'm really at a loss how to answer them. My knowledge of current Canadian society is very poor indeed. As any long-term resident of Japan well knows, social patterns in a country can change enormously in a decade. While I suspect that Canadian society isn't subject to changes quite as rapid as the astonishing transformations currently under way here, I am sure that contemporary ways of thinking in Canada must differ from those I am familiar with. I simply cannot answer their question. Not honestly, anyway. So back to that application form I was filling in. Nationality? Well it sure doesn't seem British. I left England when I was five years old, and the only things I know about Britain are what I read in the newspapers. Canada? In this case I know even less, as the newspapers only mention Canada very rarely, and even then tell very little about real life there. Actually, I'd kind of like to leave that space on the application form empty. I suppose a truly stateless person would get very angry at me for saying such a thing, and indeed, millions of people around the world would give up everything they own in order to obtain Canadian or British citizenship. But such people, I think, are mostly those whose original country has failed them - has failed to provide a stable social order in which they could live peacefully and productively. So of course such people see Canadian nationality as a 'ticket to freedom' and an escape from persecution or totalitarianism. So don't misunderstand my comment about leaving that space blank. I recognize that I was very fortunate indeed to have grown up in two such well-ordered and stable societies. But, presumably due to that rather extreme mobility during my formative years, any 'nationalistic' feelings I may have had are very weak. Can I guess the next question in your mind? "What about Japanese nationality?" Now that I seem to be settling down quite comfortably here, am I starting to become Japanese? This is a tough question. We sometimes read in the newspapers about various foreigners who have taken this step, so the idea of a foreigner gaining Japanese nationality is no longer such a weird idea as it seemed just a few years back. (Although such a thing was possible even a hundred years ago - Lafcadio Hearn being perhaps the best-known example ...) I am sure that if I took such a step (and assuming that it was granted), my friends and neighbours would accept it ... on the surface. But in their minds of course, I would always be 'different'. For better or worse, rightly or wrongly, the people living in these islands do have an image of themselves as a very homogenous group, and this self-image is very strongly embedded indeed. Possession of a piece of paper proclaiming Japanese nationality would in reality be little more than possession of a piece of paper. Although it would symbolize full entry into this society, real practical acceptance could only come from one's actions: from living among Japanese people in a Japanese way ... from understanding the language at an advanced level ... from total immersion in Japanese culture over a long period of time ... indeed, by actually 'becoming' a Japanese. But do I have to choose? I said above that I don't really feel 'English' and don't really feel 'Canadian', but actually it's the idea of nationality that I don't really like so much. I'm not such a dreamer as to suppose that all the peoples of the earth can 'hold hands and be happy together', but there is no doubt that it is strong nationalism that has caused many of history's troubles. So if you don't mind, I'd kind of like to sit and watch the game without choosing sides. And anyway, I just remembered something! There's no way that I can ever become Japanese. There is one thing that must forever separate the Japanese from the rest of the world. A barrier that cannot be crossed. A gulf that cannot be bridged. Dare I even mention the word ... Yes, that ultimate test for those who wish to understand what it means to be truly Japanese ... a bowl of steaming white rice topped with natto! On the back page of the previous issue of this newsletter, I mentioned that I was using e-mail for communication back and forth with the girls in Canada. This is working out quite well, and a couple of months ago we started using our Macintosh computers for doing spelling quizzes together. I had noticed that there were frequent spelling mistakes in their letters to me; they speak English very well, but it's taking them time to 'catch up' with their written work. So to try and help them, I type some sentences into the computer, each sentence with one word missing. I then use the computer's microphone to record my voice speaking a list of the missing words. When I send this to them by e-mail, they can see the sentences on their screen and can hear me 'dictating' the words. They fill in the words and send the quiz back to me for correction. They also sometimes use a fax machine to send me their homework assignments so that I can offer advice or correction. And of course, once a week we talk on the telephone for about an hour. Voice e-mail, fax, telephone ... If any of you have the impression that my family has been 'split up' and scattered around the globe, you're wrong!